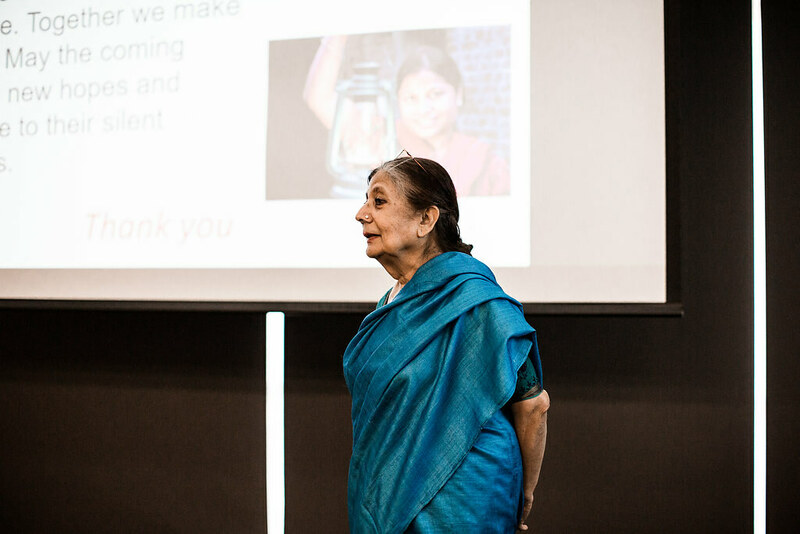 Dr. Qamar Rahman, dean of research science and technology at Amity University in Lucknow, India, drew a crowd of faculty and students across disciplines at her lecture on Wednesday at the Cecil J. Picard Center. The talk, titled “Women! A Vulnerable Population in Occupational Settings,” addressed both home and work-related threats to the lung health of women and children in India and the developing world. “Dr. Rahman has dedicated her career to the principle that clean air is a basic right that all people deserve,” said President Joseph Savoie after welcoming Rahman to the University of Louisiana at Lafayette. A globally recognized research professor in chemical engineering, Rahman’s discussion highlighted the ways in which environmental hazards such as the exposure to asbestos and the inhalation of silica from sand, rock, and mineral ores are often encountered in low paying, manual labor sites. In addition, she addressed the issue of indoor air pollution that many women and children in developing countries continue to experience when using cooking and heating fuels, like wood, feces and coal. Rahman opened her talk with an introduction into India, itself, painting a picture of the country's cultural, architectural and educational feats but quickly turned the discussion to some of the struggles certain demographics continue to face. India is the world’s biggest asbestos importer. The $2 billion industry provides the country with more than 300,000 jobs. However, the International Labor Organization estimated in 2014 that about 100,000 people die every year from workplace exposure, and experts believe thousands more die from exposure outside the workplace. The majority of those people are women and children, according to Rahman. “I went to different asbestos industries,” she recalled. “I noticed the women. They sit in a room, and they work, but they do not wear gloves or face masks. Typically, male workers are engaged in underground mining and opencast mining regions, while their female counterparts are involved in the milling and processing units, where fiber concentration is high. According to a report to which Rahman contributed, Rajasthan, the country’s largest state in terms of area, caters to more than 90 percent of total production of asbestos in India, with 60 percent coming from unorganized sectors, or sectors that are not represented by unions and do not receive benefits. While asbestos was finally banned in unorganized units in 2003, Rahman said her recent visit to Rajasthan revealed that work continues to be done illegally. The environmental health issues, as she pointed out, do not end with this particular industry but instead cross other globally popular businesses, like brick making, which has been proven to cause respiratory diseases, skin allergies and even spontaneous miscarriages. She explained that women who work with firework production often experience eye irritations, headaches and vomiting. Even working in the agriculture sectors that produce tea and spices means exposure to pesticides and vector born diseases. Factors like high unemployment, meager public spending on health and delays in national policy implementation make it almost impossible for government entities to control and diminish these issues entirely. Rahman then proposed a new research center, the Centre for Environmental Impact on Women’s Health. The center would focus on objectives that would include organizing primary screening medical camps for women, raising awareness of the impact of indoor air pollution and educating women on adopting lifestyle changes for a cleaner living environment. After a brief Q&A following the lecture, Dr. Karen Burstein, executive director for the Picard Center, presented Rahman as the 2018 Cecil J. Picard Fellow. Her lecture was also the first in the Innovators & Scholars Seminar series put on by the Office of the Vice President for Research, Innovation and Economic Development. (Photo Credit: Megan Bergeron/Megan Bergeron Photography) Above, Dr. Qamar Rahman, an inhalation toxicology expert, discusses environmental safety issues in developing countries.